When talking about stairs, flooring, or other wood products, prefinished simply means that the customer does not have to apply any stain to the wood to color it or apply any polyurethane or top coating to seal in the color and give the wood the smooth, shiny finished appearance. Prefinished versus unfinished stair treads. Factory finished flooring has many advantages over site- applied finishes including installation time, competitive pricing, selection, healthy living and environmental factors. According to NuStair, [link] remodeling stairs with pre-finished treads is a straightforward process that can usually be completed in about one day. It eliminates the necessity to remove the nosing from your original staircase, saving time and the mess of home sanding and sawdust in every corner of your project space. Along with quick installation and competitive prices, Callaghan’s maintains strict quality guidelines on all prefinished treads we sell. NuStair treads are Amish American made in Pennsylvania using select or better American hardwoods with a Lifetime Structural Warranty and a 10 Year Warranty on all wood. If you have allergies, you may have been advised that carpet holds dust much more than prefinished hardwood. Prefinished hardwood stair treads are a healthy alternative to carpet and can be easily cleaned. The smell of polyurethane can also cause health problems for sensitive family members or pets. Using prefinished stair treads eliminates that problem. 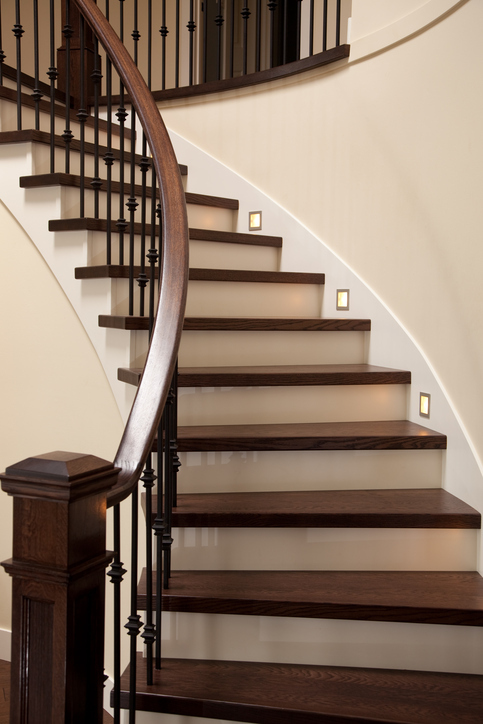 In addition to being cost effective, simple and elegant, prefinished stair remodeling is also environmentally friendly. Stair covers are installed over the existing substrate framing and nose, revitalizing and refinishing the high-use, high profile tread of the stairs, while reusing the existing framework. This effectively saves the entire wooden substrate from being torn out and put into a landfill, eliminating the new wood needed to build another staircase. Stop by Fred Callaghan Carpet & Flooring to our sample our selection of NuStair prefinished treads plus the large variety of colors and species including Red Oak, White Oak, Maple, Hickory, Walnut, Brazilian Cherry, American Cherry just to name a few.